Only 90 minutes away (via the jet-foil ferry service) from the city of Nagasaki, lies the Goto archipelago. Composed of over 140 islands and surrounded by a beautiful blue sea and blessed with an abundance of natural beauty, you can enjoy fishing year-round in its sea, and can also enjoy a host of marine sports. Outside of this, the Goto Islands' histroy is as rich as it is long. Once a stopping point for the Tang dynasty China envoys, the island also housed Christian worshippers who were fleeing persecution. From the castle remains in Fukue to the bukeyashiki samurai residences, Goto has inherited many rich and interesting cultural properties, some of which are currently on the list of tentative UNESCO World Heritage sites. Whatever your interest, Goto has something to offer anyone, from children to adults. The Goto archipelago is situated furthest west in the Kyushu Region of Japan, around 100km west of Nagasaki Port. Due to an oceanic warm current, the surrounding sea is relatively warm, even in the winter. Nationally, the Goto Islands are not a very well-known spot, and thus theisland has been relatively left alone, and therefore retains much of its natural appeal and much of the coral reefs are still intact. The island has several diving shops for those who would be interested in diving, and also has guides that can show you around the island. 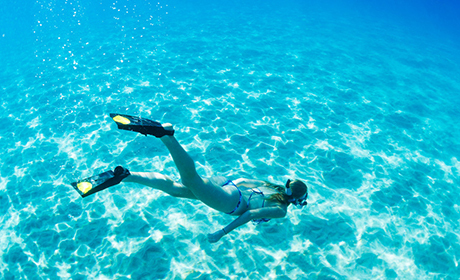 There are courses for beginners as well, so please take a peek into the beautiful sea during your stay. For the fisherman, in Goto it is entirely possible to charter a boat to do deep sea fishing, or go to any of the famous coastal fishing spots to catch your fare. The Goto Archipelago contains 52 uninhabited islands. Striped beakfish (parrot fish), black porgy, sea bass, and scorpionfish are just a few of the different variety of fish that you'll find out in the surrounding sea. 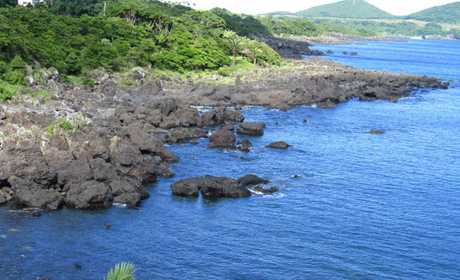 If you are planning on big game fish, Kojima beach by boat is a recommended spot. 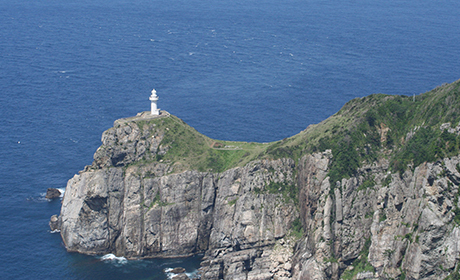 Situated on the westernmost tip of Kyushu region lies the Osezaki LIghthouse. Known as the "place where setting sun sinks into the sea", there is an observation deck where one can watch the beautiful, and famous sunset. On a sunny, clear day you can also see the Danjougun Islands. The must-see spot that will allow you to see all the way to Kami-Goto (the northern area of the archipelago chain). 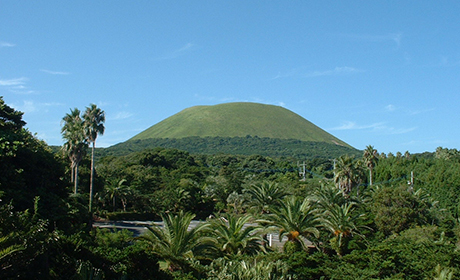 The mountain is completely covered in green grass, and changes colors with the seasons. In the spring and summer seasons, you can also enjoy small flowering plants on the mountain, and contrary to its name (which means "demon", or "ogre" peak), the beautifully streamlined volcano provides for a beautiful trek. At the top you will be able to see all of Fukue city, and on a clear, sunny day, all the way up to Kami-Goto. #55 of Japan's top 100 coastlines. About an hour by bus from the Fukue, in the summer there is also extra buses that operate to carry people to Takahama. 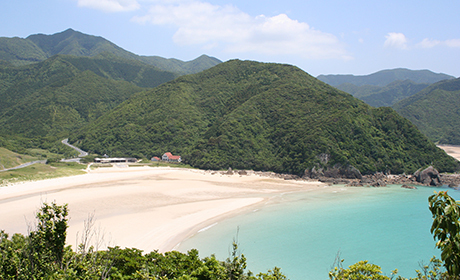 Pure white sands, and a crystal clear sea are two of the reasons why Takahama was chosen as selection number 55 of Japan's top 100 beaches by Japan's Environmental Agency. In 2004, it was also adorned with the title of Japan's most beautiful beach by Nikkei Shinbun. Come here to see why. This beautiful coastline was formed when Mt. Onidake erupted. The coastline is around 7km long, and seems to go on forever. 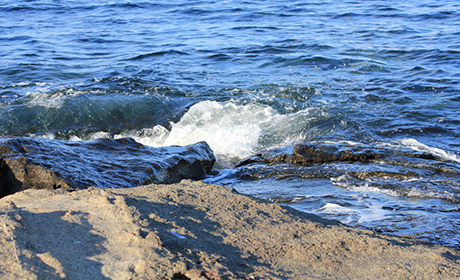 The black lava rocks create a striking juxtaposition against the crisp, clear blue sea. This area is a no-frost zone, and is warm yearround. This area is also spot where subtropical plants grow plentifully. The area is full of beautiful trees and flowers, so please add it to your list of places to visit while here. 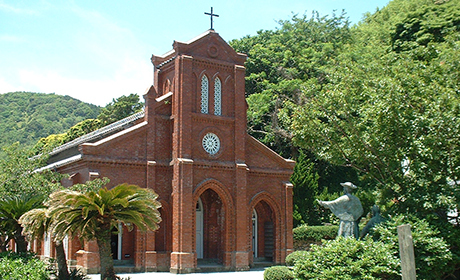 There are many churches within the Goto Islands. Some of them are buildings that have been around for almost 300 years. Over the years the churches, and the worshippers themselves, have endured many hardships, and things have not always been easy for them. A lot of the churches were built with the funds donated by worshippers who did not have a lot of money to give. Two of churches (Gorin Church, and Egami Church) have been added to a tentative list for UNESCO World Heritage sites in 2016. This Goto High School sits on the ruins of the Ishida Castle. 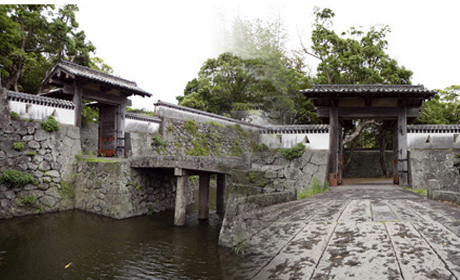 The Ishida Castle was one of the last to be built during the Edo Period, to help defend against foreign invasions. 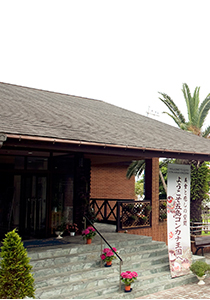 Right now, in addition to Goto High School, there also sits a shrine, a culture center, a small museum dedicated to the history of the area, and a library. While the castle may no longer be standing the walls remain, and help us to imagine what it would be like to live during that period. 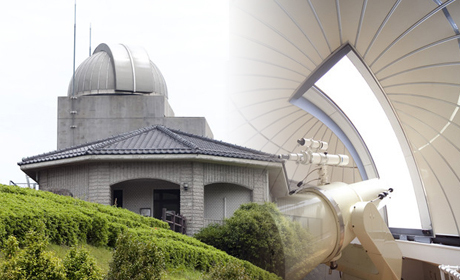 The Onidake Observatory is equipped with a 60cm Newton-type reflecting telescope. The observatory is situated on the south side of Mt. Onidake (which is the symbol of Fukue Island). In addition to the telescope, the observatory is also equipped with a research room that has a 100-inch screen in it. Another boasting point for the islands is that they are the home of the camellia flower's natural habitat. 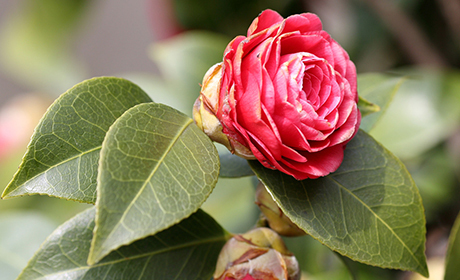 The camellia has not only been adopted as a symbol of the Goto Islands, but is also a protected resource here.